ICR Education Services provide coaching classes to the student for NATA; Our institute have highly qualified professional Architects and Designers. We also prepares student for Gate, Ceeds, AIEEE, NID exam, NIFT exam, CEPT etc exam. Our Coaching Classes will start 19/03/2016. 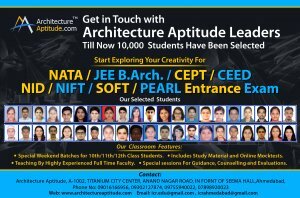 For more information about all National Aptitude Test in Architecture (NATA) in India visit our website at httpwww.architectureaptitude.com or call us at 08460040022.